Hi everyone! Sorry for the radio silence the last few weeks. Since the school year ended, I have taken a little break! I plan to be back into my routine next week! This teacher needed a little break! Spotlight: Our spotlight of the week is Sarah of Foxy's Domestic Side! We just love this perfect striped look that Sarah is rocking! 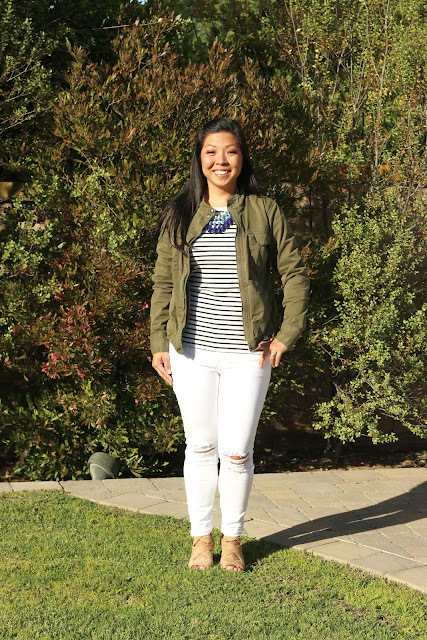 This is an outfit that is classic and always looks so well put together! Be sure to take a look at her cute blog! Jacqueline, this dress is amazing! I love the color and I seriously never would have thought to pair leopard and dark brown with it, but they look fantastic together! Well done! You look stunning in that color, love this look. That is such a gorgeous color on you! Love the pop of leopard! Such a pretty dress! Love the lace! Your Summer style is lovely. The dress and earrings are gorgeous Jacqui. In love with this yellow dress!! Love the darker accessories, you look gorgeous! That color of dress is fantastic Jacqueline!! FYI--the linkup says it doesn't start for another 9 hours?? That dress is gorgeous! Love the leopard clutch with it! 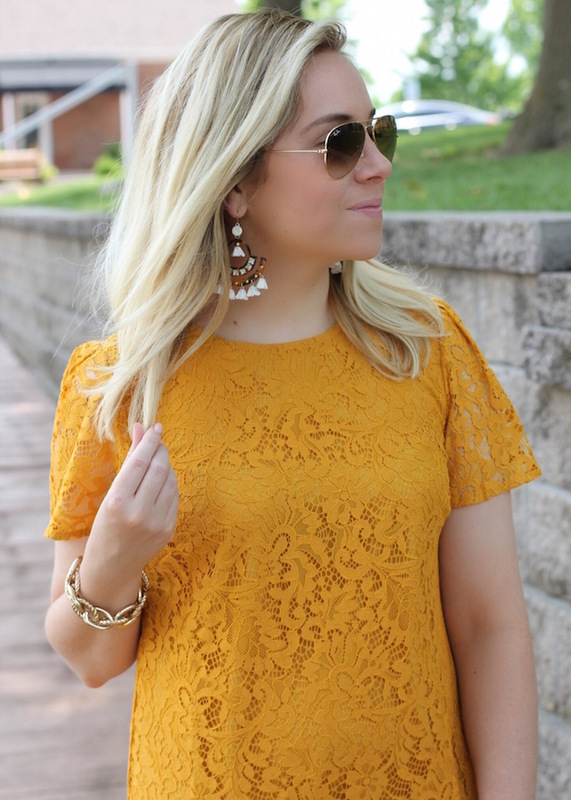 Hey Lady you look fab in this golden rod lace dress! I hear you on taking a break, this teacher gets out June 16 and I am outta here for some much needed rest and a vacay! What a gorgeous yellow dress, and sometimes we just really need a break! Enjoy! Such a pretty dress and love those glam earrings! Love this dress! The color is gorgeous on you! This is so cute! I love the color! Oh I love that dress! Especially the color. The Loft puts out such cute dresses each summer. I hope you can join Ladies Who Link Up on Fridays! Peace! OMG - this dress is simply gorgeous! I love the lace and the color! This dress is beautiful on you! I love the lace, and the leopard clutch is perfect! I just bought a top in this color. Love it for summer. This dress is gorgeous on you. Love this color combo together. Looks great! Can I ask what size you purchased? I have been seeing this color everywhere lately and love it! You look amazing in this dress and color!